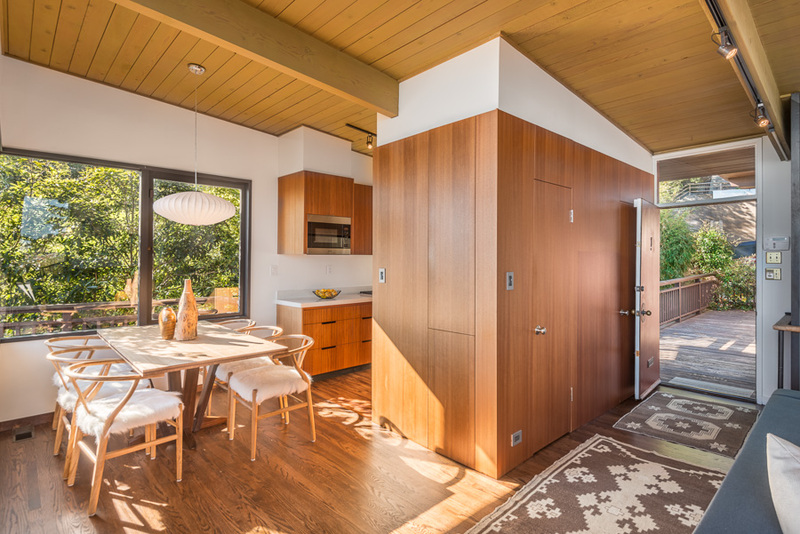 Perched along the eastern edge of Glen Park amongst coastal cypress and redwood trees, this incredible mid-century home was designed by notable Bay Area Architect Worley Wong and enjoys sweeping views and clean lines. The home features three bedrooms, two and one half baths, approximately 2,040 sqft, and two car parking with beautiful oak hardwood floors throughout. An elevated walkway leads to the front door and opens directly into the exquisite living room with panoramic eastern views including downtown San Francisco, the Bay Bridge, the Bay, and beyond. The wall of windows, perfectly framing the view, leads to a walk-out view deck, allowing for indoor/outdoor entertaining. The living room is flooded with morning light and benefits from a wood-burning fireplace and a series of built-in shelves. Adjacent to the living room is the dining space with beautiful eastern views including Bernal Hill, Mt. Diablo, and the Bay. The kitchen has been thoughtfully remodeled with stainless steel appliances, quartz counters, and high quality cabinetry. Completing this level, behind a wall of concealed wood paneled doors, rests the convenient powder room, coat closet, and additional storage. The middle level of the home hosts three bedrooms and two bathrooms, split by a hallway, allowing for use as one residence or as two separate homes. On the southern end of this level are two bedrooms and a full bath. 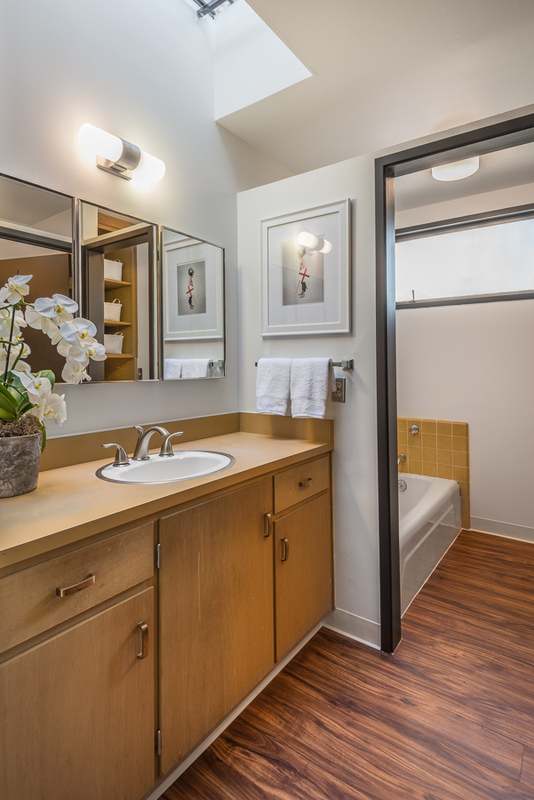 The bathroom was recently renovated to include a clay-colored soaking tub, European-style glass shower, and multiple frosted windows allowing for great natural light to pour through. Both bedrooms enjoy incredible morning light and overlook the greenery below, creating a serene and private oasis. Depending on your needs, the other end of this level can either function as a separate in-law unit or can be fully integrated into the home. The in-law space includes a living/dining room with a full kitchen and a separate entrance. Down the hallway, past the second full bath, is the third bedroom, which enjoys windows on two sides and overlooks the mature landscaping below. A laundry room and hallway leading to the family room separates the two spaces. The wood-paneled famliy room is located on the lower level and enjoys windows on two sides with outlooks to the lush greenery. A highly unique zen garden is accessed from the second level of the home, allowing for incredible privacy and creating a serene place to relax. Mature bamboo, a Japanese maple, and redwood trees transform this outdoor space into a private retreat. The home includes a two-car garage, great storage, and a wine cellar. One Miguel St offers exceptional flexibility and can be used as either a single family home or a two-unit building. The home feels like a private retreat nestled amongst the trees, while still having access to all that San Francisco has to offer. One Miguel Street is ideally situated along the eastern edge of Glen Park on a quiet street with access to Billy Goat Hill, Walter Haas Playground, the commercial center of Glen Park, BART, and the freeway.